Description: Violet Willoughby doesn't believe in ghosts. But they believe in her. After spending years participating in her mother's elaborate ruse as a fraudulent medium, Violet is about as skeptical as they come in all matters supernatural. 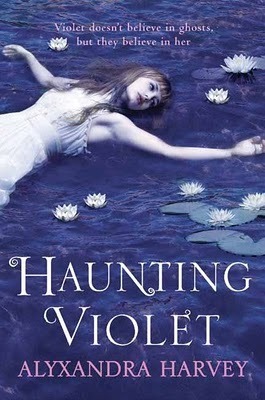 Now that she is being visited by a very persistent ghost, one who suffered a violent death, Violet can no longer ignore her unique ability. She must figure out what this ghost is trying to communicate, and quickly because the killer is still on the loose. About the Author: Alyxandra Harvey lives in a stone Victorian house in Ontario, Canada with a few resident ghosts who are allowed to stay as long as they keep company manners. She loves medieval dresses, used to be able to recite all of The Lady of Shalott by Tennyson, and has been accused, more than once, of being born in the wrong century. She believes this to be mostly true except for the fact that she really likes running water, women’s rights, and ice cream. Aside from the ghosts, she also lives with husband and their dogs. She likes cinnamon lattes, tattoos and books. Please visit her website here. To read my review, click here. Really like the cover and the blurb is intriguing. All success, Alyxandra. The book sounds fabulous, Alyxandra. I love ghost stories. This looks good. MY flute teacher's last name is Willoughby. Pretty name.